$39.95 In stock. Order in the next 9 hours, 54 minutes and it will go out today! 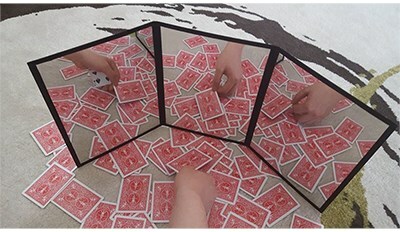 Sean Yang's 3 way mirror is not only a mirror, but also a portable close-up mat. 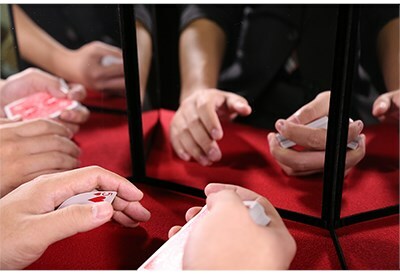 It is made of high quality safety mirror which weighs only 240 grams. It is light, thin, easy to carry and most importantly shatterproof. Not only it has all the benefits of the old 3-way mirrors, it is now indestructible and lighter than ever. After being folded, its size becomes as small as an A4 paper, so you can easily carry it in any bag or briefcase. The velvet backing not only looks elegant, but it can also act as a close-up mat. It is multi-functional and definitely worth every single penny. 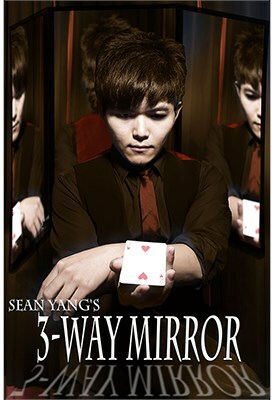 If you are in love with close-up magic, and always desire to practice anytime, anywhere, Sean Yang's 3-way mirror will be your best choice. NOTE: Due to the manufacturing process, the velvet cloth may harbor some odor of adhesive. It will go away after a few days of using it, so please don't be worried. I ordered this product and was ecstatic that it arrived so quickly, rushed to the mailbox, only to see that the postal carrier had sort of jammed the package into the mailbox. Needless to say, I was expecting to see that either the panels would be cracked or broken. With some trepidation, I opened the packet and was extremely and pleasantly surprised to see that it was perfect. I can only conclude that this was a test of durability and flexibility of this product. If you don't have one, then get one. Trust me, you won't be disappointed and can be assured of its toughness if you have to travel too. Thanks Vanishing Inc Magic. You folks have the BEST products available. This just a great product. it is so lightweight, yet meets all your needs. 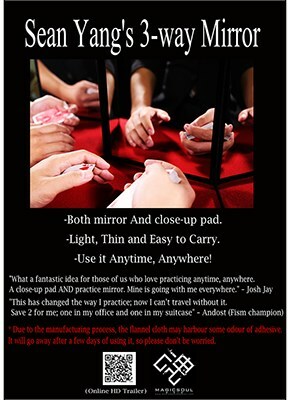 and the close up pad, because it is on the back of the mirror (which is reasonably solid), can be positioned in your lap while you are watching TV and easily use it like a lap desk for practice.